This morning I visited the Appleton farmer's market with my mom. It was a beautiful day here in Wisconsin, with weather in the low 80's. The farmer's market is held on downtown college avenue during the summer months, and inside the Avenue during the winter months. There is tons of produce, along with plants, art, jewelry, etc. Today I went down with the intention of buy some fresh produce, but instead came home with a new item of garden decor and a Ikebana. 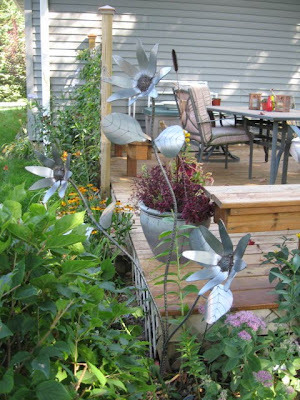 There is a local man who creates garden decor out of scrap metal, and I was excited to see him at the market today. I just had to have this piece when I saw it, and even better my mom bought it for since my birthday is a few weeks away! 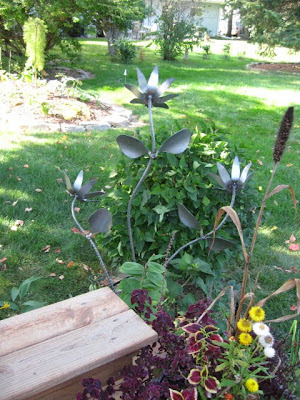 The metal will rust as it sits outside, and I am hoping by spring it will be completely rusted. Thats awesome! I love it! I love when they get rusty! So pretty!